Graco is voluntarily recalling its Classic Wood Highchairs after reports of children falling from the chairs, the U.S. Consumer Product Safety Commission announced Tuesday afternoon. So far, Graco has received 58 reports of the highchair seats loosening or detaching from the base. In nine reported cases, children have fallen from the highchairs as the seat separated from the base of the chair. The kids have suffered bumps, bruises and scratches, and at least one child in Canada suffered a concussion as a result of a fall from the highchair. About 86,000 highchairs in the U.S. and 3,400 in Canada are being recalled by Graco, in cooperation with the CPSC and Health Canada. 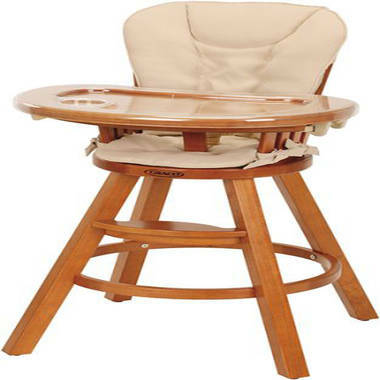 Description: This recall involves all Graco brand Classic Wood Highchairs sold in three wood finishes. The high chair has a top seat, bottom leg assembly and removable tray. The high chair is sold with a beige fabric seat cover. Model number 3C00BPN, 3C00BPN TC, 3C00CHY, 3C00CHY TC, 3C00CPO or 3C00CPO TC is printed on a label on the underside of the seat assembly. Sold at: Babies R Us, Burlington Coat Factory and other retail stores nationwide and at Target.com and Walmart.com and other online retailers between September 2007 and December 2010 for about $130. Remedy: Consumers should immediately stop using the recalled high chairs and contact Graco for a free repair kit.